Dr. James Cody was born in St. John, Newfoundland, Aug. 22, 1820; came to Wisconsin in 1846, locating in Watertown; he studied medicine with Hall Kittridge, of Chelmsford, Mass. 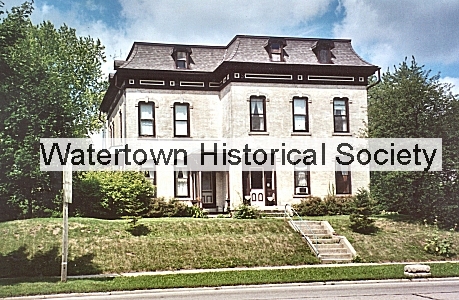 ; he completed his medical course, and received his diploma in March, 1844, at Harvard University; he then came to Watertown, and since 1846, has been in the practice of his profession; he was Superintendent of Schools of Watertown for two terms; was appointed by Gov. Barstow as Surgeon of the Wisconsin State Artillery; about 1863, was Examiner of Pensions for the United States Government. Dr. Cody married, Nov. 12, 1848, Adeline Rogan, of New York; he has two children – Adeline and William Gordon. Mrs. Cody died Aug. 12, 1872. Dr. Cody is a member of St. Bernard’s Catholic Church. The followed was received but the quoted source is not fully known. The publication is that of the “State Medical Society of Wisconsin” and the article was written by N M Wigginton, M. D.
Dr. James Cody was born August 22, 1820, in the city of St. Johns, Newfoundland, of Irish parentage, the names of his father and mother being Patrick and Susan Cody. His father was engaged for many years as a merchant in the fisheries of Newfoundland, and the grandfather was an Irish patriot of the most pronounced order. The doctor’s parents died when he was a mere boy, leaving him and a younger brother under the guardianship of an uncle who looked carefully to their education, which was primarily obtained in their native city in a private school. As the time advanced for a higher education, the two boys were sent by the uncle to Montreal, Canada, and placed in the large Jesuit school of that city, and there received a careful moral and literary training. The younger brother died while studying for priest’s orders. About this time the subject of this sketch began the study of medicine, the preliminaries having already engaged his attention while at the Jesuit school. The uncle watching carefully the inclinations of his ward, and realizing even at that early date the superiority of American institutions, especially that of Harvard, sent the young men to Chelmsford, Mass., and placed him under the care and instruction of Dr. Hall Kittridge of that place. From Chelmsford he took his regular courses in the medical department of Harvard University, graduating March 4, 1844, at the age of twenty-four. While at Harvard he had the benefit of such teachers as Prof. John C. Warren in anatomy, Prof. Walter Channing in midwifery and medical jurisprudence, Prof. Jacob Bigelow in material medica and chemistry, Prof. Geo. Hayward in surgery, Prof. John W. Webster in chemistry, Prof. John Ware in medicine, Prof. Samuel Parkman demonstrator in anatomy. He gave Dr. Bowditch one hundred dollars for the privilege of his office and special instruction in auscultation and percussion, the doctor having just returned from Europe where he had taken a course preparatory to teaching it in his country. During the doctor’s attendance at Harvard he also took a special course of surgery and anatomy under Dr. Warren. After graduating he practiced in Boston for a short time, but finding visits few and far between, which is unfortunately the usual experience of all beginners in the profession, he gathered his little means together and again went to Canada, where he invested a little money in a large lumber camp, and was employed by the company as its physician and surgeon. The doctor remained in this position for two years, at which time the company failed, leaving him penniless, out of a job and badly in debt. “Rather than go to prison for debt in her majesty’s dominions, the doctor turned his back upon the queen and again placed himself under the broad and protecting wings of the spread eagle in the spring of 1846.” Being enthusiastic over the prospects of the great northwest country, the doctor got together a small bundle of clothing, all his worldly effects, and immediately took passage in a small sailing craft, and coming up the lakes under great stress and difficulties, landed in Milwaukee and the wilderness full of buoyancy, hope and enthusiasm. Remaining over night only, the next day, as the doctor told it, “on foot and in company with another passenger,” he plunged into the Milwaukee woods, following the rude territorial road to Battle Town creek, where he deviated to the right following the Rock river woods road, arriving in Watertown the next day, being about the middle of April, 1846, without a dollar in his pockets but in a land of freedom, where he was destined to endure the hardships and enjoy the enthusiasm of a frontier practice lasting over forty years. The doctor now entered upon a pioneer life as physician and surgeon. “Poorly equipped as he was, his love for his profession, coupled with indomitable courage and a sound constitution, enabled him to surmount all difficulties.” Being without a horse his visits were usually made on foot for over a year. The roads were few and horrible; no bridges over small streams, few over large ones, and trackless forests to pass. In his lonely trips to his forest-bound patients, often the doctor’s only guide was the smoke in the distance from the rude shanty of some recent settler, the sound of the axe, or the ever welcome tinkling of the ancient cowbell as it swung loosely over the neck of the leader of the herd. But these guides often failed as the darkness came over the lonely forests, compelling the doctor occasionally to spend the night within a fallen tree-top, lighted up by a great fire to keep the mosquitoes and other animals at a respectful distance, with nothing to cheer his lonely vigils but the hoot of the owl, the screech of the night-hawk, or the dismal howl of the prowling wolf. These are no fancy touches, but are the actual experiences of that noble soul at that early period. Hunger and thirst were also never-failing companions to fatigue. Whisky was abundant and cheap, but was only used by the more abstemious to satisfy the ague microbe. At that early period the doctor’s saddle-bags contained only a few necessary but effectual remedies. Quinine, opium, ipecac, jalap, nitrate potash, antimony, and a lancet to bleed all fevers, were thought sufficient for all medical emergencies. With quinine at $8.00 an ounce and New York the nearest market, this article was often absent. Common salt and cayenne pepper were occasionally used as a substitute. The second winter the doctor succeeded in getting a horse and “cutter,” the latter consisting of a crockery crate perched upon a couple of bent poles, the front ends answering for thills; and one of the amusing sights of that winter in Watertown was to see the doctor coming down Main street in his “pung;” and if the horse chanced to run away, the occupant always succeeded in being “thrown out” over the back of the seat, but strange to say, never was hurt. The doctor was married November 12, 1848, to Adeline Rogan, daughter of Capt. Jas. Rogan, of Watertown, who bore him four children, Manning, Edward, Adeline and William, the latter two still living. Dr. Cody held but few offices, and was absolutely devoid of political ambition. In early times he was elected superintendent of the city schools for two terms. He was appointed by Gov. Barstow as Surgeon of Wisconsin State Artillery, and in 1863 was appointed examiner of pensions by the government. He was surgeon for the St. Paul and Northwestern railroads for over thirty years. He visited Pittsburg Landing by invitation of the governor just after the battle, and gave a graphic account of the scene upon his return. Through hard work and economy the doctor was enabled to accumulate a large property and was considered at one time quite wealthy. Politically the doctor was an uncompromising democrat, of the Jacksonian order. Religiously he was a staunch Roman Catholic; but in religion, as in politics, he was inclined to peace. His life was fruitful for good, his reputation unsullied and his death lamented by all, which sad event took place Oct. 8, 1894, in the 75th year of his age. Dr. Cody was noted more as a surgeon than as a physician, although he had a large practice extending over the greater part of two counties; in fact, many of his neighbors thought they could not legally and legitimately depart this life until they had finally seen the good doctor and been told the end was inevitable. The writer of this obituary well remembers many cases of this kind during his student life with the doctor. As a surgeon, Dr. Cody was conspicuously ahead of his time. One of his constant themes was “union by first intention.” He often debated why it was so infrequent, or upon what principle it took place at all. As early as 1866 he always insisted that all accidental and intentional wounds should be scrupulously clean with soap and clean spring water, or what he thought better, hot water. He claimed that cleanliness did away with some subtle source of suppuration which separated the parts and prevented primary union. Although he did not know what it was, he was convinced a cause existed, and knew that cleanliness was in the right direction. He often spoke of Dr. Wolcott’s amputation at the shoulder joint, in which union took place primarily. The writer of this article remembers a few of the doctor’s capital operations in which union took place by first intention. One was an amputation of the lower leg for epithelioma of foot and ankle. Another was the amputation of a large fatty tumor of the left chest walls; also amputations of the breast. The doctor began his medical career just at the dawn of the discovery of anesthetics, and just one year after the great discovery of Morton of Boston, the doctor was using it in his practice in surgery in the city of Watertown. He gave it sparingly at first, and at times preceded its administration by large doses of whisky. This was so different from his teachings at Harvard, where whisky and opium were always relied upon for their stupefying effects, that he was not only surprised but made bold to operate where otherwise he would have been satisfied with palliative measures only. The discovery of anesthetics made the doctor a surgeon. He placed the three cents on the card and left, no doubt congratulating himself that if he had not done the lucky thing he had the handsome. Though a burglar, and willing to be a thief on a big scale, he is evidently above being mean about small matters. Another neighbor of the Doctor’s, Mr. Charles Wood, did not come off quite as well. He was visited the same night by a different customer or the same one. His dwelling was also entered and robbed of a beautiful rosewood box containing jewelry, notes and other articles, of about $30 value. These night-roaming gentry should be watched. A charge of gun powder would do them good, and perhaps have the effect of inspiring a salutary fear and prevent further depredations and losses. There is much reason to believe a gang of house robbers are prowling about the county. They have been in this city, visited Waterloo, and other places. They are evidently carrying out a quite extensive plan of operations, and most every day we hear of their attempts to steal. The best way to put an end to their night enterprise is to be ready to make them a present of the contents of Colt’s revolver. William Cody, born 1862, was the eldest son of Dr. (James) and Adeline Cody. Dr. Cody's second marriage turned out to be very troublesome. Young Bill gave every appearance of engineering a divorce between his father and stepmother. Obviously, it was thought, in an attempt to have all his father's property deeded to him. But there is much evidence that his stepmother was unfaithful to his father: and when the divorce became final, Dr. Cody's property, which included two houses and at least a dozen farms, were all assigned to young Bill. Over the years Bill lost all the farms and both houses. Although Bill Cody had graduated from a prestigious pharmacy school, he spent little time as a pharmacist. Watertown became aware of him when he began proceedings to close barber shops, bars and other public places on Sundays in Watertown and neighboring towns. 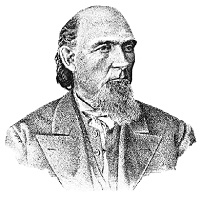 During the course of these proceedings he became quite proficient in the law, and was known throughout the town has "the best damned lawyer in Watertown". At one time he had a stable of race horses and apparently did quite well with them. The entire state became aware of Bill Cody through newspaper reports about his numerous lawsuits concerning his cows which were kept in a barn behind the family home on North Church Street (which is now between Super America and Papa John's). Even at the present time, many people believe that he kept the cows in the basement of his home, but there is no evidence to support that. His cows were pastured near what is now the Buffalo Inn. At times the cows wandered into the pastures of neighboring farms and were confiscated by those farmers. The resulting lawsuits to regain possession of his cows were followed by newspapers all over the state. 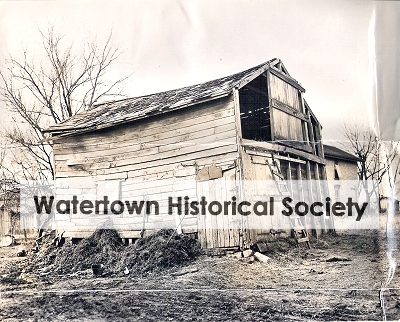 Bill Cody's escapades in Watertown ended after his final eviction from the house on Church Street in 1931 after which he and his wife, Mary, moved to Merton, Wis., where he died in 1947. Jan. 11, 2006: Ben Feld, of Watertown, is the author of the new book, “The Best Damned Lawyer in Watertown: The Bill Cody Story,” published by Hometown Series of Publications. 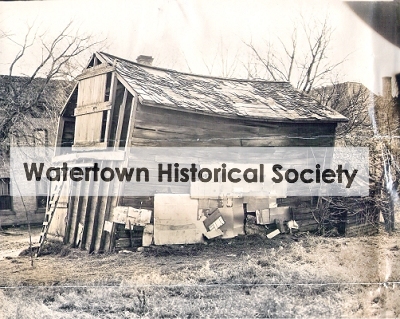 Feld’s book consists of his own thoughts and clippings from newspapers including the Watertown Republican, the Watertown Gazette and the Watertown Daily Times dating back to the 1800s. In the book through a progression of newspaper clippings Feld documents Bill Cody’s life and how he became a well-known Watertown resident. Feld said although newspaper clippings referred to Cody as the “best damned lawyer in Watertown,” Cody was actually a licensed pharmacist. Feld said Cody’s many scrapes with the law and experiences with the legal system helped him earn the title as lawyer. Kiessling, Elmer C., Watertown Remembered (Watertown: Watertown Historical Society, 1976), pp 58 and 60. Dr. Cody, an early Irish leader in Watertown . . . Harvard-trained Dr. James Cody served with distinction as school superintendent, army surgeon and examiner. Cody, James, physician, s.w. cor. W. Main and O’Connell, res. w.s. Oak Grove rd, 2 n. of R’y track. Cody, Wm. G., res. w.s. Oak Grove rd, 2 n. of R’y track. Cody, William, res. 114 N. Church. No 3: Dr. James Cody (a Civil War veteran) is buried in St. Bernard’s Cemetery, Watertown.